XML (eXtensible Markup Language) Web services are making business-to-business (B2B) transactions simpler, more seamless and more efficient than ever. XML, which was built on open industry standards that enabled Internet based data transfer across any platforms or applications, is fast becoming the “common language” of the Web. XML is a mark-up language standardized by the World Wide Web Consortium (W3C). It provides semantics-aware markup without losing the formatting and rendering capabilities of HTML. XML’s tags capability of self-description is shifting the focus of Web communication from conventional hypertext to data interchange. XML’s extensibility allows the users and application to declare and use their own tags and attributes, ensuring the logical structure and content of semantically rich information to be retained. It focuses on the description of information structure and content as opposed to its presentation. Where it is used and why. The standard markup language represents a breakthrough in one sense by giving companies a common language to use to transmit data over the Internet. This is a huge advantage over EDI, which requires participants to rent bandwidth on a costly private network. XML has an obvious advantage over EDI in that it leverages existing infrastructure, such as the Internet and is therefore not expensive to adopt. And it does have some technical advantages. In XML tags define everything, and you can extend the document by adding more tags. Two partners can agree to a specific extension of a purchase order. That gives much more flexibility. You can also drop an XML stream on a piece of paper and read it. That's not true for EDI, which is only machine-readable (8). XML can make use of facilities provided by the latest version of the Internet Hypertext Transfer Protocol (HTTP), which can identify when a message should be moved from one stage of the interchange process to another, and to check that the relevant forms of interchange have taken place (Bryan). 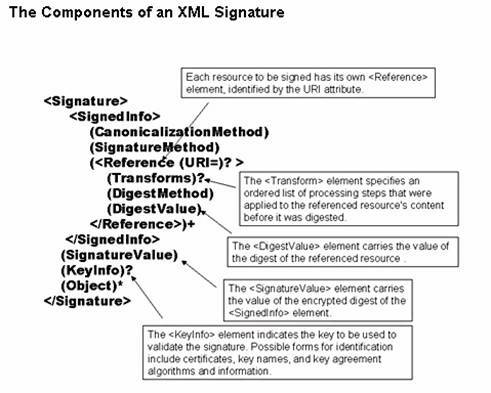 The very features that make XML so powerful for business transactions (e.g., semantically rich and structured data, text-based, and Web-ready nature) provide both challenges and opportunities for the application of encryption and digital signature operations to XML-encoded data (Simon). XML Signature is a joint effort between the World Wide Web Consortium (W3C) and Internet Engineering Task Force (IETF), and XML Encryption is solely W3C effort. To create a digital signature for a message, the data to be signed is transformed by an algorithm that takes as input the private key of the sender. Transformation is determined by the sender's private key and can only be undone if the reverse transform takes as a parameter the sender's public key. This allows the recipient of the transformed data to be confident of the origin of the data and the identity of the sender. If the data can be verified using the sender's public key, then it must have been signed using the corresponding private key to which only the sender has access. Still for signature verification to be meaningful, the verifier must have confidence that the public key does actually belong to the sender otherwise an impostor could claim to be the sender, presenting her own public key in place of the real one (Simon). Largely due to the performance characteristics of public-key algorithms, the entire message data is typically not itself transformed directly with the private key. Instead a small unique thumbprint of the document, called a "hash" is transformed. XML signatures are digital signatures designed for use in XML transactions. The standard defines a schema for capturing the result of a digital signature operation applied to data. XML signatures have been designed to account for and to take advantage of the Internet and XML and they should provide authentication and data integrity according to Simon, Madsen and Adams. have its XML signature embedded within itself (the signature is the child). Security can be bypassed simply by exploiting XML’s flexibility and extensibility paired with its semantics and structure. XML fragments, can present data from multiple sources. The components of an XML fragment are like baking ingredients-you, mix them together in varying amounts based on a recipe. These ingredients can be spread throughout the Internet “kitchen.” This potential dispersion of information introduces validation issues. Without a reliable method of validating the source of the data and the accuracy of the information itself, a hacker could introduce spoofed data into a transaction or transformation of data. XML instances can use links to resources, making them transient in nature. With all the “ingredients” identified, XML provides you with two options: You can make the cake, by collecting and presenting the XML information in an XML instance, or you can take a picture of the cake, by providing pointers and links to the applicable information. In either case, the end result for users looks the same. A complete XML instance may be presented without any real data in it, just Uniform Resource Identifiers (URIs) that point to particular elements. This transient quality really extends the “security is only as strong as its weakest link” metaphor. It could be that you have limited control over some of the data but must still rely on the security controls surrounding it. XML is transport independent; it doesn't specify a particular transport mechanism. Current implementations use HTTP for transport-a universal skeleton key for virtually any network. Firewalls don't stop HTTP, and they won't stop XML, regardless of your application. Thus, XML can generate security problems that other forms of data do not. XML instances can look exactly the same on the surface and yet still be different in content. Even well formed syntactically correct XML instances may be structured differently due to tag placement, use of white space, and other style mechanisms. These differences, though they don't impact the quality and content of the information, introduce a level of ambiguity that adds to the need for validity and security. XML offers powerful abilities to structure, manage, share, and process data, but it also opens some possibilities for hackers. Just like email and HTML files, XML files can be captured as they travel over the Internet. Do your data files contain sensitive information? It is tempting to mix sensitive and innocuous data together in a single XML data file and then use templates to format the information for appropriate audiences. Even if you control who can run the templates that display the sensitive information, the more public templates may point the way to the XML file. Once they know it is there, hackers could bypass the templates and retrieve the whole XML data file. Unicode, on which XML is based, has a huge character set (65,000 characters), offering many new opportunities for hackers to create attacks that bypass conventional protections. An example is a Microsoft IIS vulnerability that allows access to folders (5). In an XML-based world, firewalls must be capable of dipping into XML streams traveling over Web ports to check their payloads, much as today's email virus checkers dip into email data streams on mail servers. However, if the XML stream is encrypted, then the traditional firewall is of limited use. Because it simply cannot read the data, the firewalling logic must move to the points where the XML document is decrypted and processed (Conolly). XML-specific security is obscured by the complex way that data enters and leaves computers on Internet connections. Differing ports are used for separate networked applications, like e-mail or chat, and this enables firewalls to recognize and filter network traffic. However, it is now standard practice to send XML data over the ports allotted for Web traffic, effectively disguising the XML as normal Web browsing traffic. Whilst it is an appealing prospect to bypass firewall restrictions in this way, it does mean that security is required at a higher level than the network access layer (O’Neill “Bringing XML to PKI). At the moment many XML users are unaware of these problems. They may rely on their systems integrators to address these issues but failing to address them leaves their companies extremely vulnerable. Take the example of a company with a back-office system used for procurement, ERP or day-to-day administration, using XML to integrate services direct into the server. By its nature, XML integration sits on top of the Web technology that is the focus of so many malicious attacks today. Any company exposed in this way runs the danger of revealing vital confidential data to outsiders. Competitors could steal customer and supplier details or highly confidential pricing information. Revelation of this kind of material is not only commercially sensitive but it could also unleash all manner of data protection penalties. One model, proposed by Gabillon and Bruno, used to regulate access to XML documents uses the XPath language. XPath is a language for addressing parts of an XML document. It models an XML document as a tree of nodes. 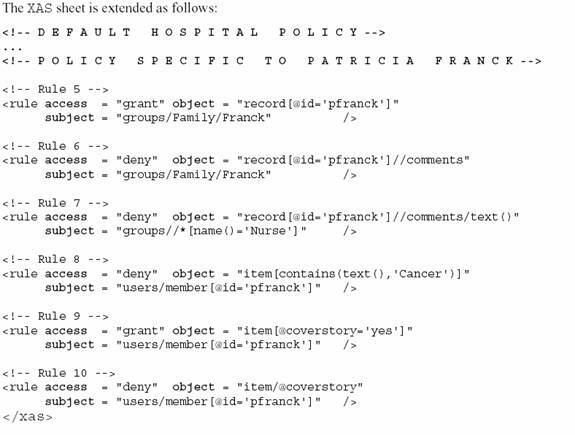 An example would be a medical record like the following; the tree represents the XML document. Rule 9 says that Patricia is permitted to see the item, which is a cover story but rule 10 says she is forbidden to know the item is a cover story. This model allows security policies with a high expressive power since any node can be independently protected. The semantics and the possibility of defining content-based authorization rules are unique.